Yonella Demars has been a Diagnostic Medical Sonographer for over nine years. She has a BS and Master’s degree in Radiologic Sciences and is currently in the candidacy phase of a Radiation Science PhD degree. Her interest is burnout and organizational commitment among sonographers in the U.S. She is also an author and entrepreneur of SONONOTES, a platform that she uses to educate students, sonographers, and/or her peer educators in topics that relate to sonography. SONONOTES also provide annual scholarship opportunities for students and sonographers to aid in paying for registry examination fees. 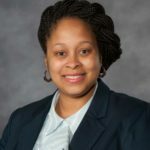 Yonella is currently the program director of Virginia Commonwealth University’s Diagnostic Medical Sonography bachelor program that is scheduled to begin Fall of 2019. The business is called SONONOTES, the first guide that was published under SONONOTES was the Pediatric Sonography Study Guide. I am working toward getting SONONOTES to become a source that offers ultrasound study guides, mock exams, retail items, and educator resources. SONONOTES also provide students and/or sonographers with registry scholarships yearly. This year we did not have anyone to apply. I’m hopeful however that the more the word is spread about SONONOTES the more scholarship applicants I know we will have in the future. The study guide is 128 pages from cover to cover which includes 16 chapters, a quick reference pathology table, 242 images, a 100 question post-test, and it offers the opportunity for customers who successfully pass the post-test to be awarded 10 SDMS CMEs. No, it never crossed my mind. What did you find most rewarding/challenging about the project? Creating the post-test questions and formatting the guide was most challenging. I had no clue on how to format a book, just a college term paper. Let’s not talk too much about how to effectively write a test question. That’s for another interview (laughs). The most rewarding things about this project was when it went to production, my first sale, and my first customer review. I understand you were also a contributing author for an ultrasound textbook. Can you tell us about that? Yes, my manager at the time introduced me to Reva Curry, the author of Sonography Introduction to Normal Structure and Function, who was looking for contributing authors for her 4th edition textbook. I was assigned the Biliary chapter which I felt shouldn’t be too hard since I viewed this anatomy as a sonographer practically every day. I am currently also a contributing author for her 5th edition that will be published in the near future. Inherit best practices to scanning techniques, increase proper utilization of ergonomic equipment, attend conferences or subscribe to ultrasound journals that would keep them informed of current trends in sonography like fusion imaging, elastography, and ultrasound contrast imaging. Congratulations on your past “Clinical Preceptor of the Year Award”! Can you share something about that experience with us? I did not know I had the gift of teaching until I was encouraged to accept students during my night shifts as a sonographer. My manager saw something in me that made her always say “You should be a teacher”. My response would always be “uh, no” (laughs). I enjoyed showing people things and training new hires but I wasn’t sure about teaching. I enjoyed sharing information that helped me as a sonographer. I also found ways to make students feel comfortable learning. Whether that was a quiz, verbal questions that made them take what they had learned from their instructors and apply it in the clinical setting, repetitive conversations about pathologies, or assisting them with writing preliminary reports the “shorthand way”. I remember creating a Jeopardy board that I taped to one of our ultrasound room walls for one of my students. He was really excited about that approach to learning. After a couple of students had rotated with me I began to get phone calls from other students that wanted to experience a clinical rotation with me. I did not know the true impact that I had on students and their instructors until I received the “Clinical Preceptor of the year award”. I was blessed to have been recognized and to have received this award. As a teacher, what sort of pitfalls do you see students falling into that can hinder their academic success? Technology–Social media, video games, and cell phones have a strong presence in the 21st century. Students have to be determined to achieve academic success and they have to master prioritizing their time to do so. Thinking back to when you started your career, where did you think it was going to lead you? I thought I was going to be a traveling sonographer or an ultrasound manager with multiple registries. Did you have a mentor or influencer early on in your Sonography career? I had several. Professionally I had my instructor; Myka Bussey-Campbell (DMS program coordinator at Georgia Southern University), Dr. Rochelle Lee (Nuclear Medicine program coordinator at Georgia Southern University), Dr. Elwin Tilson (previous department head of Armstrong Atlantic State University’s Radiologic Science Department and currently professor of Radiologic and Imaging Sciences at California State University Dominguez Hills), and my manager Peggy Bizjak. Personally I had my husband and 2 friends, Helene and Jennifer, who encouraged me spiritually. Collectively all my mentors or influencers understood my potential and encouraged me in more ways than they know. I am happy to have had them in my life whether it was for a season or years. Can you describe a time when you had a measurable impact on the life of a patient? One that I can remember is performing CPR on a lady that had collapsed in the restroom at an ultrasound event that I had attended. I didn’t think much of it until 10 members of her family made a surprise visit to my job days later and presented me with a thank you card and hugs. Later I was able to meet her as a sonographer but she didn’t know who I was or what I had done for her (tears and smiles). I would say that impacted her life and the life of her family. I want to mention that by me having a past employment history of being a patient care technician and certified nurse assistant I have impacted the lives of all my patients. My patient care experience prior to becoming a sonographer really excelled and molded the care that I promised to provide to my patients as a sonographer. During my sonography career I have purchased toys for a pediatric patient, magazines for a young adult transplant patient, listened to the “crazy” patient (at least that’s what he said people thought of him), polished the toes of a geriatric transplant patient, and bathed a homeless urine soiled patient. Exceptional patient care to me is more impactful than saving a life from performing CPR. I say this because you will rarely be required or given the opportunity to perform live saving CPR as a sonographer BUT you will very well get a whole lot of opportunities to provide exceptional patient care to every patient. My name is Yonella Demars and I am an exceptional patient care provider! Who did you/do you have as a role model in your career? I didn’t necessarily have a role model. However after meeting Dr. Kevin Evans, the JDMS editor-in-chief, at a recent ultrasound conference and reading his biography I would like to model the research and publishing career path that he has taken in his career. So, Kevin Evans if you are reading this I would like to work on a research project with you in the future. What accomplishment would you consider to be most important to the success of your career? Obtaining multiple registries, particularly those that are related to courses that I would like to teach. I would also like to finish school and obtain my PhD in Radiation Sciences. I have a strong desire to do research in the sonography profession. As a Sonographer, what sort of trends do you see in the field? Work related injuries, contrast ultrasound imaging, and multi-disciplinary approaches to patient care. What suggestion would you give aspiring sonographers to best prepare for these future trends? If you weren’t a Sonographer, what would you be doing instead? I would be a perfusionist or a radiologist. Is there something we might be surprised to know about you? As an ultrasound student, I traveled to Guyana, South America with other radiologic science students. We performed ultrasounds, x-rays, and mammograms on citizens that had walked miles to receive free imaging. It was a huge eye-opening experience. I hope to start my own ultrasound missions before I leave this world. What would you like future Sonographers to know about the field? We are an important part of imaging departments. We are the first to interact with fetuses, we know what cancer looks like, we know when a patient has appendicitis, a torsed testicle, or in the process of miscarriage. We are story tellers that use images to create a beginning, middle, and an end. We work hard to create each story no matter how big or small. We are essential medical professionals that have the “eye” for everything! I’m happy to announce that I am the ultrasound director of Virginia Commonwealth University’s newly created Bachelors of Science ultrasound program which is set to begin in August 2019. Visit https://radsci.chp.vcu.edu/ in the future for more information. Mrs. Demars a is registered Diagnostic Medical Sonographer with a masters in Radiologic Science from Midwestern State University. Her first year as an ultrasound clinical preceptor she was awarded “Clinical Preceptor of the Year”. She holds membership with the SDMS and ASRT organizations. She is currently pursuing a Doctoral Degree in Radiation Sciences with the goal of becoming a globally known professor of ultrasound. She has experience in teaching online Imaging Pathology and Radiologic Science Management courses.